Lygodesmia juncea with galls of Antistrophus lygodesmiaepisum (Hymenoptera: Cynipidae) on stem. The Loess Hills landform along the western edge of Iowa and extreme northwestern Missouri is home to a unique assemblage of plants and animals. The majority of these are associated with loess hilltop prairies – grassland remnants that have their origins in the hypsithermal maximum of several thousand years ago and that persist as small relicts on the landform’s steep, dry, south- and west-facing slopes. Many of the plants and animals found in these grassland remnants are more typically found further west in the Great Plains, but hang on in the Loess Hills as hypsithermal relicts. Antistrophus lygodesmiaepisum galls on stem of Lygodesmia juncea. One such hypsithermal relict is rush skeletonplant, Lygodesmia juncea, a wirey, leafless-looking plant in the family Asteraceae¹. More common in the Great Plains, this plant occurs in Missouri only on these loess hilltop prairie remnants. 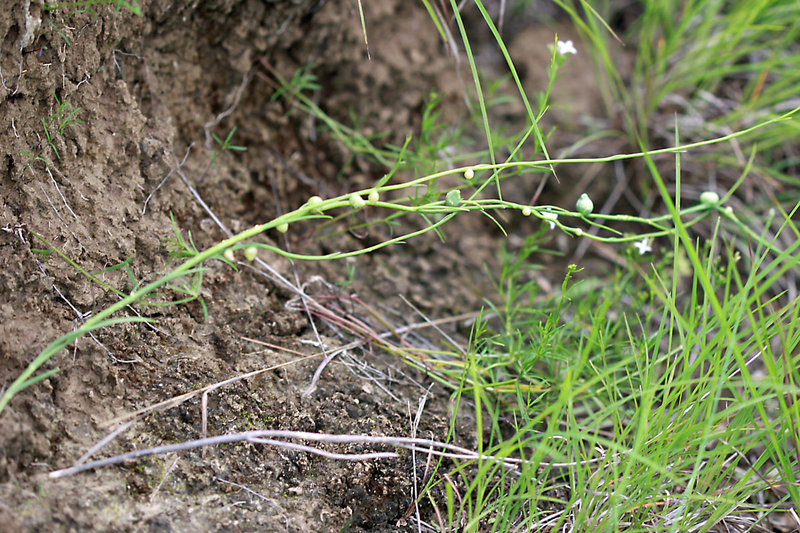 The first time one encounters this plant, they are left with the impression that the plant bears small, pea-like fruiting structures along the length of its stem. 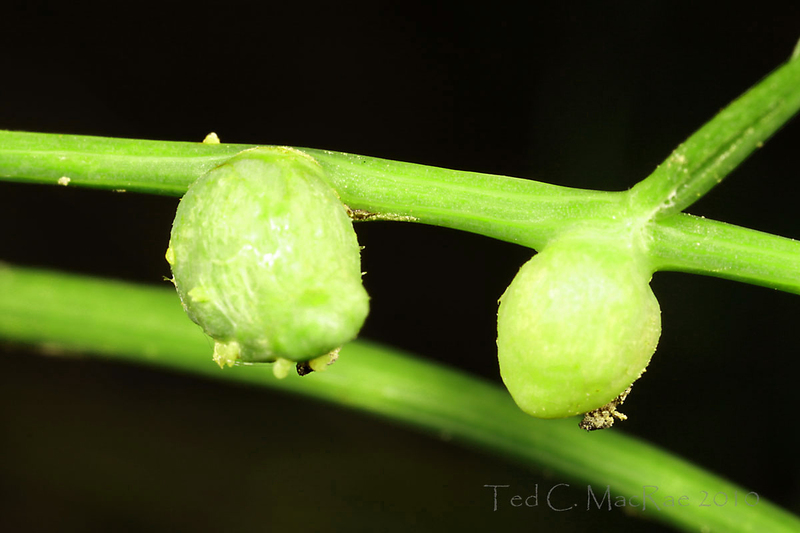 These are not fruiting structures, however, but galls made by the cynipid wasp Antistrophus lygodesmiaepisum. Although this insect does not have a common name, it is associated exclusively with L. juncea, as suggested by its specific epithet (which also alludes to the pea-like galls with the suffix -pisum), so I see no reason why this wasp cannot be called the “rush skeletonplant pea gall wasp.” Some sources variably misspell the genus as Anistrophus (without the first “t”) or the species name as simply pisum, a synonym first introduced by Ashmead in the late 19th century a few years after the species was described (I made both mistakes [and also erroneously referred to L. juncea as skeletonweed] in one of my earliest posts: The Loess Hills in Missouri). It would seem that Antistrophus lygodesmiaepisum is the correct name, according to Pickering (2009). ¹ Not to be confused with rush skeletonweed, Chondrilla juncea – also in the Asteraceae, which despite the similarity of common names, specific epithet, and general appearance (except with yellow flowers) is an altogether different plant that was introduced from the Mediterranean Region and is now considered an invasive weed in much of the Great Plains. Antistrophus lygodesmiaepisum larva in gall on stem of Lygodesmia juncea. Rush skeletonplant exudes a latex-like sap when damaged, making it unpalatable to most grazers – this latex-like sap can be seen when the galls made by the wasps are cut open. Cynipid wasps are the second most diverse group of gall-making insects behind the gall midges, and many species are mono- or oligophagous (Ronquist and Liljeblad 2001), meaning that they are associated exclusively with a single plant species or group of closely related species. Antistrophus lygodesmiaepisum is one such monophagous species, thus its occurrence in Missouri, like that of L. juncea, is restricted to the tiny loess hilltop prairie remnants in extreme northwestern Missouri. In recent years, these prairie relicts have suffered heavily from conversion to agriculture, abusive grazing, and suppression of fire that has led to invasion by woody and exotic plants. In Missouri, only about 50 acres of loess hilltop prairie remain, and only half of these are in conservation ownership, making it among the most critically imperiled of natural communities in Missouri. While lacking the conservation charisma of L. juncea and the dozen or so other plants and vertebrates that are restricted in Missouri to these prairie remnants, A. lygodesmiaepisum nevertheless deserves equal consideration as a Missouri species of conservation concern. I knew this would be a difficult ID Challenge and am quite impressed that at least a few people figured out at least the correct genus. Tim Eisele scored 8 points in this challenge to not only take the win but also move way up into a 3-way tie for 4th place in the overalls. Ben Coulter continues to be Mr. Consistency, earning 4 points for 2nd place and retaining his overall lead by an almost insurmountable margin (see what happens when you play every game!). JasonC beat out the other contenders for the final podium spot on the basis of a bonus point, but the hot contest continues to be the battle for 2nd place overall. Janet Creamer still holds it at 14 pts, but there is a veritable gaggle of contenders nipping at her heals – the next few challenges could be interesting. Photo 1: Canon 100mm macro lens (ISO 100, 1/250 sec, f/2.8). Photos 2-3: Canon MP-E 65mm 1-5X macro lens (ISO 100, 1/250 sec, f/14). All photos: Canon 50D , Canon MT-24EX flash w/ Sto-Fen + GFPuffer diffusers. Typical post-processing (levels, minor cropping, unsharp mask). This entry was posted in Asteraceae, Cynipidae, Hymenoptera and tagged conservation, entomology, gall wasps, Hymenoptera, insects, Loess Hills, Missouri, nature, prairies, science, wasps. Bookmark the permalink. Cool ID quiz, Ted. I knew this was a hymenoptera, and thought perhaps a leaf-cutter bee larva, nestled in plant matter as it was. The moisture level and lack of pollen ball didn’t sit right, though. PS — You’re missing out on some great weather up here! I heard about the weather there – I’ve never been more thankful that I am hot and sweaty right now! I like your suggestion of considering A. lygodesmiaepisum as a species of conservation concern, and I was actually just contemplating proposing a survey of bur oak gall wasps in Massachusetts for this reason. Quercus macrocarpa is listed as a Special Concern species here, but I think it may be teetering on the brink of de-listing. There are a number of neat galls that are associated exclusively with this host, and I suspect that some of the cynipids that cause them are rare enough to warrant listing even if it’s decided that the tree population is in good shape. Among insects, MA currently only lists odonates, leps, tiger beetles, and the federally Endangered American Burying Beetle. Insect lists in just about every state are woefully incomplete and ill-considered – especially in more western states (except California). It is almost as much about politics as it is about science (or more so!). It wrankles me to no end that something like the American burying beetle gets listed but not other beetles are are truly under much greater threat such as the Highlands tiger beetle (Cicindela highlandensis), Coral Pink Sand Dunes tiger beetle (C. albissima), and other western sand dune-associated species. There are many, many other insects that may be threatened or endangered, but we simply don’t even know enough to say one way or the other.